Thanks to Bill McGuire, from Mac's Motor City Garage for this comprehensive and thoughtful history of the Graham Blue Streak. His original post can be found HERE. Historians agree: Amos Northup’s Graham Blue Streak is one of the most influential automotive designs of the 1930s. What makes it so noteworthy? Let’s take a look. The Graham brothers—Joseph, Robert, and Ray—were successful entrepreneurs, the kind of investors we call venture capitalists today. Their many enterprises included agriculture, glass, and truck manufacturing, and for a time they managed the giant Dodge Brothers organization for the investment bank Dillion, Read & Company. For their final foray into the auto industry, in June of 1927 they acquired Paige-Detroit and quickly put their their stamp on the Motor City car maker, renaming the products Graham-Paige and then simply Graham. On December 8, 1931, the second-series 1932 Graham Model 57 Blue Streak was introduced, featuring a groundbreaking body design by Amos Northup. The Blue Streak look, which Graham continued through 1935, was a genuine style setter as much of the industry followed its direction. “The most imitated car on the road,” boasted the Graham ads. While many of the Blue Streak’s innovations seem evolutionary, a logical and natural progression from one era to the next, the credit goes to Graham and Northup for seeing the future and executing it. While the catalog illustration above is a tad idealized, it effectively shows what made the Graham so fashion forward. Arrows have been added to indicate the key advances. Most notably, the front and rear fender sweeps have been skirted in behind the wheels. Concealing the exposed chassis and mechanical components, the fender valences also create a longer, smoother profile. The grille shell and windshield have been laid back at a sporty angle, finally breaking from decades of horse-drawn carriage tradition toward a more streamlined look. Additionally, the radiator cap has been removed from the top of the shell and tucked away under the hood, another step into modernity. The headlamp buckets have been tucked in close to the body and fenders and painted body color, the better to blend them into the overall package. While the rendering doesn’t show it well, Graham was an early adopter of metallic-type paint finishes. But instead of the aluminum particles used in later pigments, this paint contained guanin, the photonic crystal that gives fish scales their iridescence. Available colors in Graham’s Pearl Essence Finish, as it was called, included Avon Blue Pearl and Opalescent Gunmetal. As the in-house designer for Murray Body Company of Detroit, Northup performed styling duties for a number of independent makes, including Willys, Hupp, and Reo. Since the smaller automakers lacked dedicated styling studios, body suppliers Murray, Briggs, and Hayes included design services to attract their business. 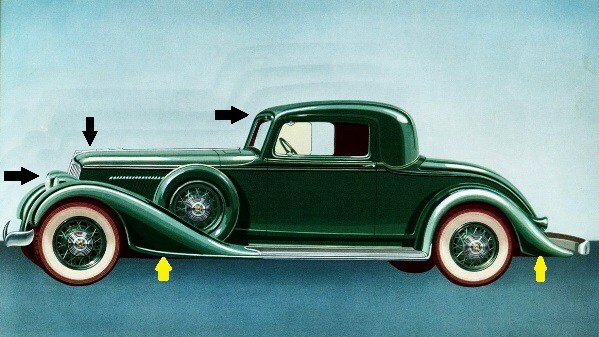 Other noteworthy Northup designs include the Reo Royale and Willys 77, but the Blue Streak can be considered the most important of his efforts—a tipping point in 1930s car design. The innovations weren’t limited to styling. To lower the stance, chief engineer Louis Thoms dispensed with the traditional rear frame kickup and crafted what Graham called a deep banjo frame, with the rear live axle captured in a pair of pass-throughs in the frame rails (above). The benefits included a 2.5-inch reduction in overall height and a more torsionally rigid structure. 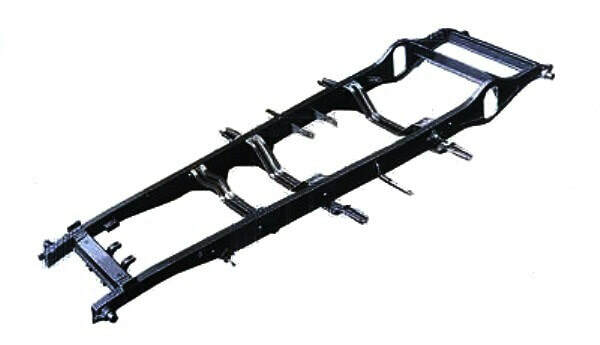 To increase roll resistance, the parallel leaf springs front and rear were mounted outboard of the frame rails. Meanwhile, the track was widened to 60.5 inches front and 61 inches rear—not just to improve cornering, it is said, but also to sweeten the car’s visual proportions in height versus width. 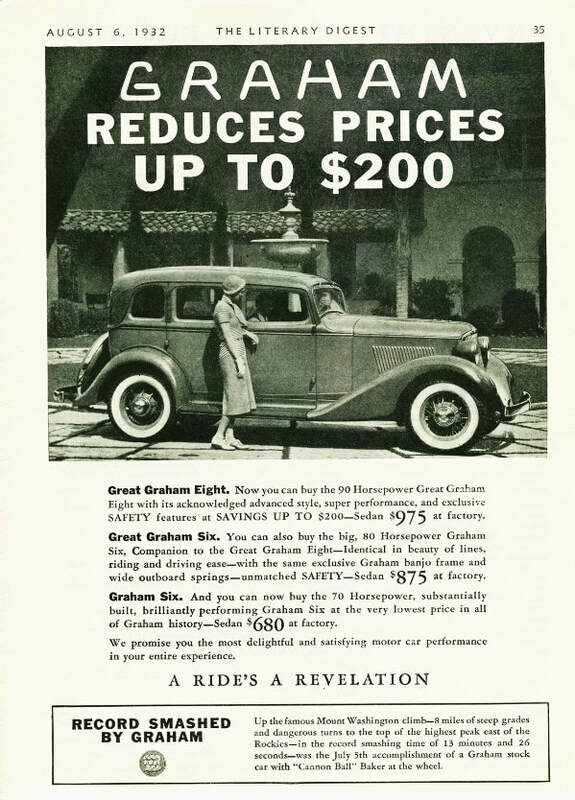 More big news came from Graham came in 1934, when the automaker became the first to offer supercharging on a popular-priced car on the Model 69 Custom Eight. 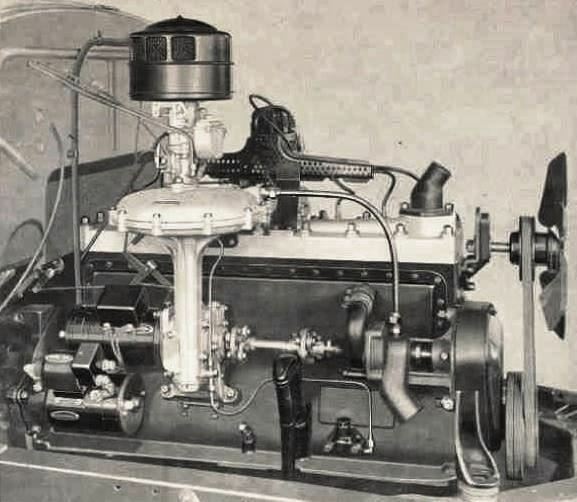 Reportedly based on the Schwitzer-Cummins technology used on the Duesenberg SJ, the Graham setup sported a 7.5-inch centrifugal blower turning at 5.75 times engine speed via an external accessory shaft. Output was increased from 95 to 135 horsepower on the 265.5 CID straight eight, producing a 10 mph increase in top speed and a significant boost in midrange punch. In the following year, a supercharged version of the six-cylinder Graham was introduced as well (GOCI Note: Supercharging on the six-cylinder line actually began two years after the eight - Bill McCall). It’s been noted that Graham built more supercharged models than the Auburn, Cord, and Duesenberg marques combined. In 2017 the Blue Streak series was recognized again as a 1933 Graham Deluxe Eight was enrolled in the National Historic Vehicle Register (GOCI Note: Bulgari's car is actually the 119-inch wheelbase Model 64 Standard Eight and not a “Deluxe Eight” - Bill McCall). 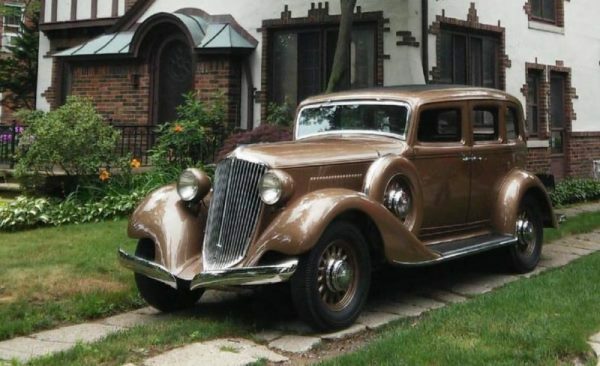 To mark the event, the Golden Tan Pearl sedan, owned by noted collector Nicola Bulgari, was photographed in the driveway of Amos Northup’s former home in Pleasant Ridge, Michigan, a Detroit suburb (above). Photo courtesy Historic Vehicle Association. Taken, with permission from Mac's Motor City Garage, 2018.